The RFM69 contains internal calibration features for the receive circuitry. So in theory different RFM69 receivers should have comparable noise levels as well as comparable signal levels provided the antenna design is the same, and also the antenna positioning is comparable for the receivers. Now lets put this theory to the test. Three different receivers were constructed, a Nucleo STM32F103, a LPC824 and a JeeLink V3C with an AtMega (Arduino compatible). 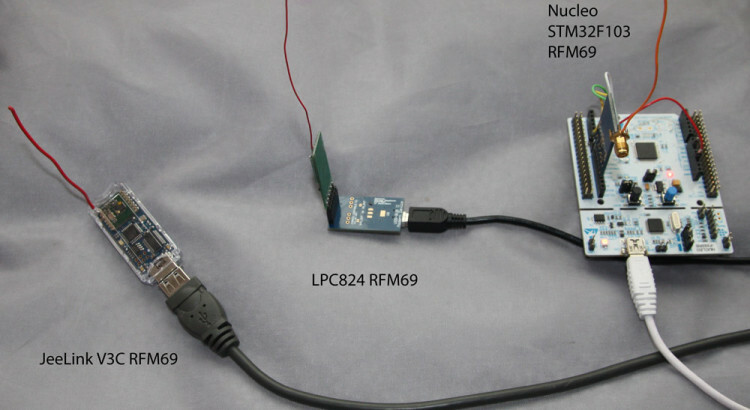 The transmitter is an LPC812+RFM69, simulating a FS20 signal at 868.28MHZ every 5 seconds. The receiving SW logs various numbers, such as a millisecond timestamp, an interval between the last series of transmissions (read 5 seconds), an interval between each of the three packets in a train (around 60 ms) and 88400031214C is the transmitted FS20 code. The interesting part is however the final two numbers in brackets. Those are raw RSSI numbers, measured during the OOK train. For all three receivers, noise levels are around 58/59 which is -99dBm. There is a slight variation between receivers. 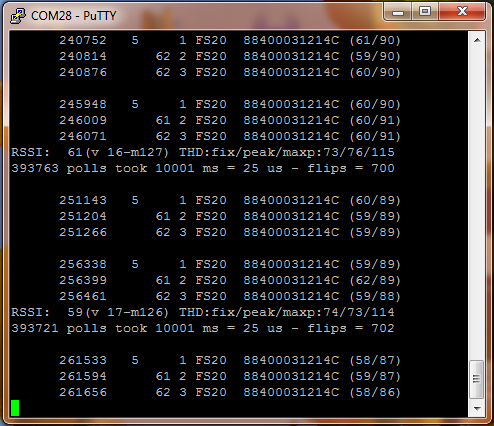 The LPC824 seems to have the lowest noise floor. Antenna’s were quite identical being a 86mm quarter wavelength wire. The receiver program samples the RSSI levels every millisecond, and calculates statistics every 10 seconds. THD:fix/peak/maxp:65/65/117 fix – the minimum value of the slice threshold, some dB above noise floor. THD:fix/peak/maxp:65/65/117 peak/maxp – SW simulation of the PEAK-threshold of the RFM69. Current and maximum. 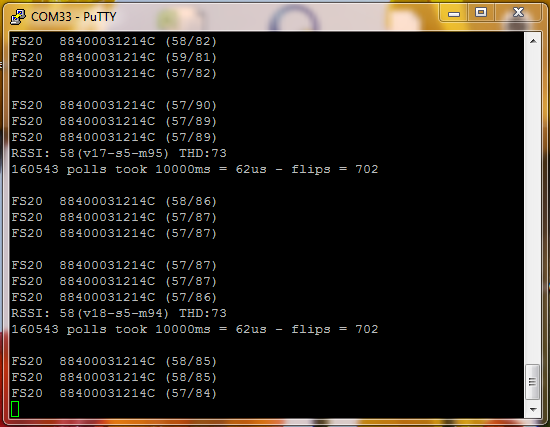 transmitter code, as well as Arduino/JeeLib/Jeelink code can be found in the same repo in different folders.